There are times when you don't have any..... and then there are times when you have many!! 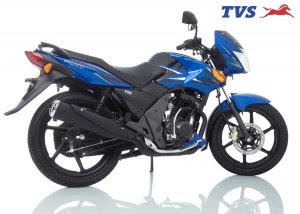 On 23rd, June, 2009, Bajaj launched the killer Pulsar 220 ..... and then within a couple of days, TVS launched the 2009 version TVS Flame - The TVS Flame SR 125. As per Mr. H S Goindi, President Marketing TVS Motor Company, the new Flame offers better low and mid range power delivery. The NVH levels have also been improved, which was a major draw-back of the first gen TVS Flame. Developed hand in hand with AVL Austria, the tri-valve TVS Flame SR 125 CC-VTi engine accompanied with Tumble Swirl Port, the Flame is all about Optimum Power Delivery, Optimum Mileage and Great City Riding Comfort. Equipped with a "Single" spark plug, the bike produces a top bang of 95 kmph and a max power output of 10.5 bhp @ 7500 rpm. Apart from the engine department, many new style tweaks have been made, like , wider rear tyres, back lit console, 240 mm front disc brakes etc. The first gen TVS Flame was also plagued with it's built quality and going by the press release of the bike, it seems that the issue has been taken care of. All in all, prima-facy it seems that we have another good 125 on our charts! !